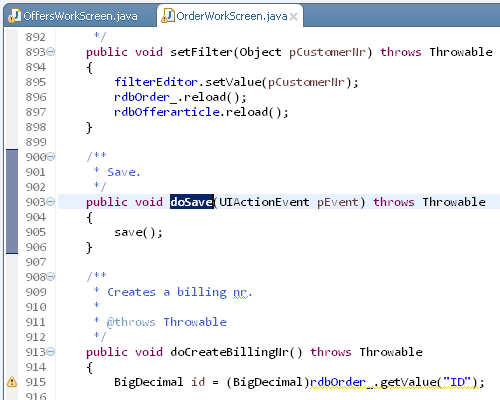 Since last year we are offering an Eclipse Plugin that integrates the JVx workflow into Eclipse. Now that EPlug 1.2 has been released, we believe it's long overdue to give you a guided tour of the experience that EPlug is offering. We offer a free trial period so that you can test EPlug without any problems. The first time you start Eclipse with EPlug you will be asked if you'd like to only test EPlug, or if you'd like to select an already purchased Pro license. When clicking the Trial button, a new trial license will be issued and you'll be able to evaluate EPlug with all features for 30 days. One of the biggest usability improvements compared to previous versions is discoverability of how to use and activate EPlug. 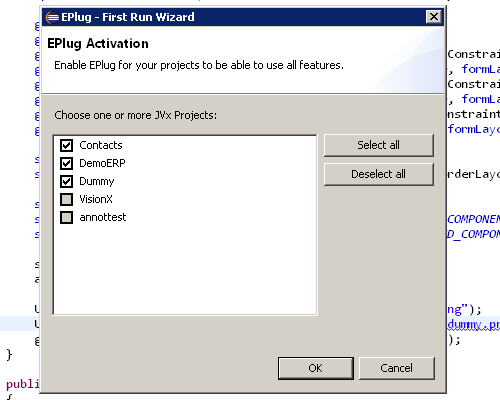 With the new version we have added a "First Run Wizard" which allows to directly activate EPlug on selected projects. EPlug integrates seamlessly into Eclipse, but to use most of its features it has to be activated on each project you want to use it with. 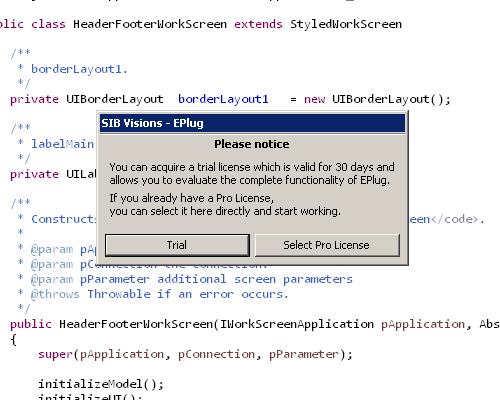 This can be done in the previously shown First Run Wizard, or by right-clicking a project and selecting "Activate EPlug" under "Configure". 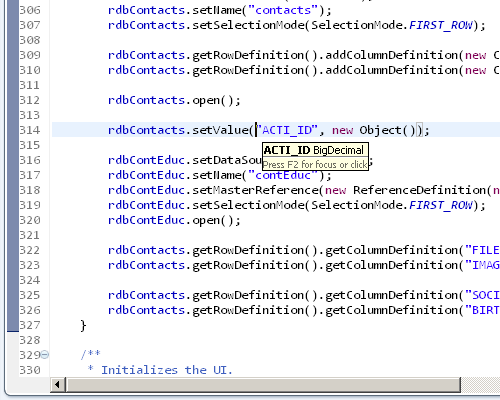 From there on you will be able to use code completion, compile time checks and all the other features on this project. A handful of commands are added by EPlug, which make it faster to navigate in JVx projects. It's often the case that you want to go from the server to the client class, or from the client to the server class. 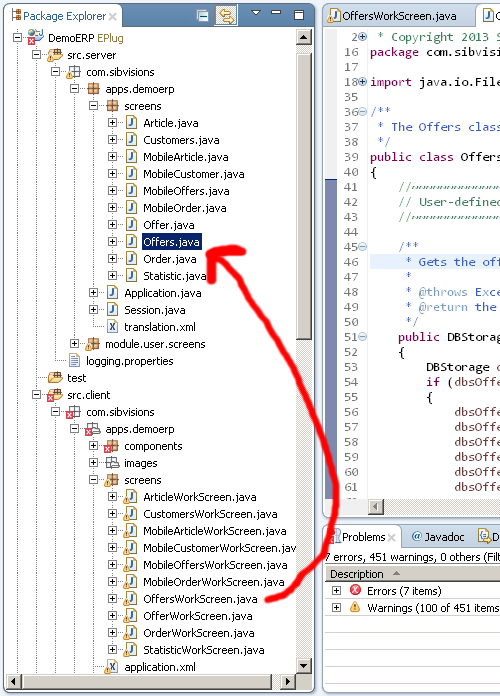 Most of the time in Eclipse this involves expanding trees and looking for the correct class in the Package Explorer. That is why we've implement the command "Go to complement class", which enables you to quickly jump from the server to client, or the other way round. As you can see the command is available from the context menu, but you can also bind it to a key in the "Keys" preferences. 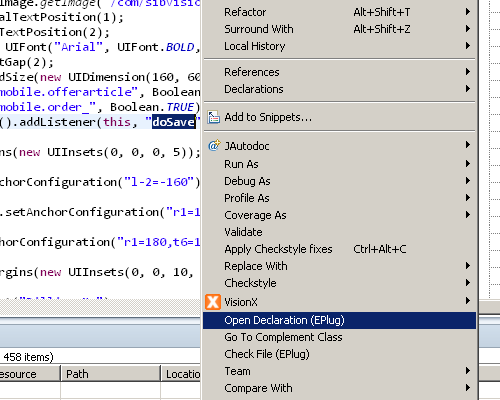 The "Open Declaration" command, sometimes known by its key binding "F3", allows you to jump to the declaration of whatever is currently under the cursor. We've extended this command with the possibility to jump to the declaration of event handlers (actions), server methods and storage's. If the item underneath the cursor is not handled by our extension, the default "Open Declaration" command will be invoked. Because we've extended the "Open Declaration" command, you can bind the "Open Declaration (EPlug)" command also to "F3" and enjoy faster navigating in your JVx files without any downsides. The biggest and most important feature of EPlug is its support for data books. 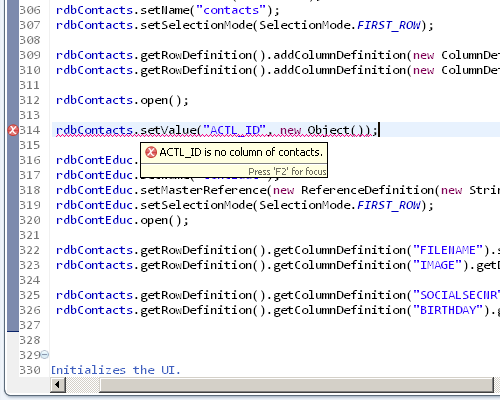 EPlug offers code completion, compile time checks and more for column names on remote and local data books. 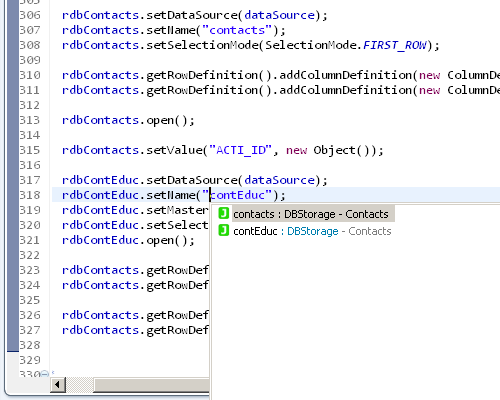 Everytime you want to get or set a value, or wire up an editor you will receive code completion suggestions with all column names that are in the databook, it doesn't matter if those are remote or added locally. Of course we also added compile time checks, which means that you can never mistype a column name ever again. With the newest version, these compile time checks are even active while you type! When hovering above a column name, a simple text hover will inform you about the type of the column. RemoteDataBooks require to have the correct name set so that the server side storage is found, of course we do also offer code completion, compile time checks, text hovers and hyperlinks for this. And last but for sure not least, with the newest version a feature has been added which I've been looking forward to for quite some time: The DataBook View. 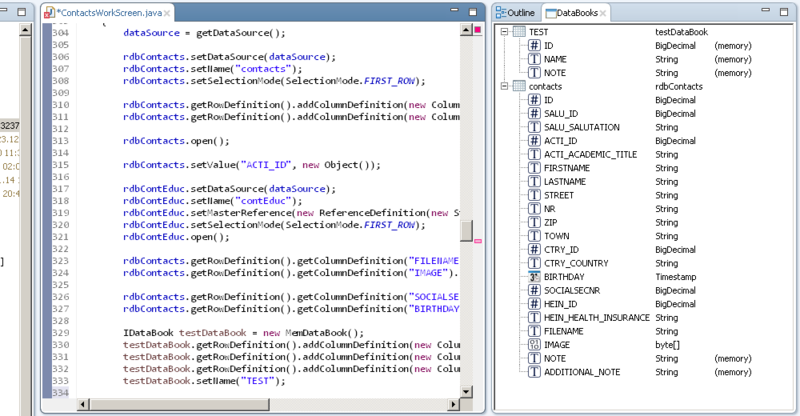 A view similar to the Outline view, which displays all databooks in the current file and all of its columns. Support for actions, events and server calls is the second big EPlug feature. For events and actions we support a very Lambda-like system that uses reflection and strings. Obviously the compiler was never able to understand this system and provide feedback or support for it, but with EPlug this has changed. 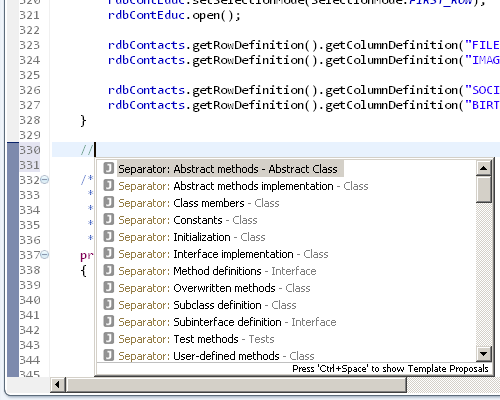 Whenever you want to wire up an event, you'll now receive code completion for all fitting methods in the used class. As you can see in upper image, we also provide a fast and convenient way to create methods if necessary. During compilation the actions, events and server calls are checked for their correctness, and if there is a problem it'll be reported to you. You can also see the quick fixes for this problem, which do not only offer to create the missing method, but also suggesting methods with similar names in case a typo happened. Additionally EPlug provides text hover and hyperlink support, that means that you can now jump to the methods by using your mouse (Ctrl+Left Click) or the "Open Declaration (EPlug)" command. Refactoring support has also been added, which means that you can now rename action/event handlers without having to manually search for all uses and change those. Dealing with resources can often be a pain in the neck, especially if you constantly have to look up the path and check if you're now using the correct image. Because we also felt these pains, we've added functionality to EPlug to make sure that working with resources becomes easy and painless. Whenever you use UIImage methods, you can now enjoy code completion, previews of the images and compile time checks. 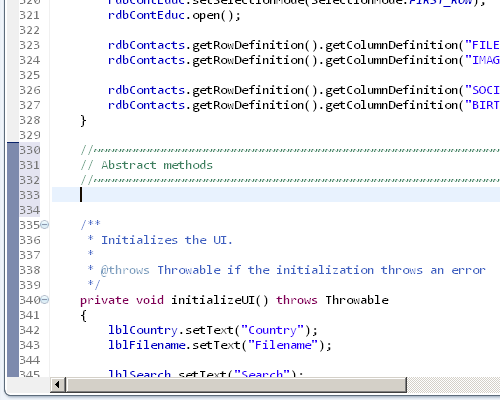 For all other resources, we do only offer a "generic" code completion system and no preview. Still, this is a huge help. 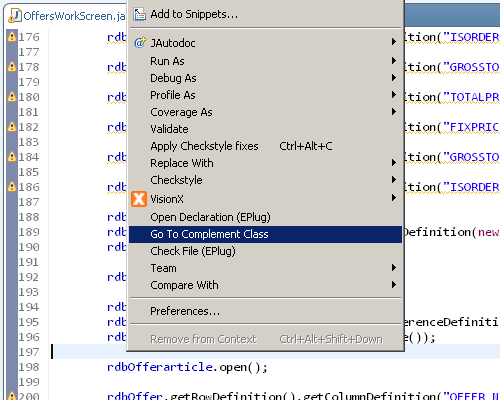 One of the more simple and not so obvious features of EPlug is that it allows to have code completion of the current class in comments, and also provides the JVx category separators. Now we've arrive at the big final, support for VisionX. For all of you who do not know VisionX, it is our product for rapidly building applications from scratch or migrating already existing systems. It allows to build GUIs and the respective database backend within a matter of minutes. Even though VisionX allows you to build whole applications, from time to time you'll want to do something by hand and this is the great thing about VisionX, all projects and applications are automatically and by design already Eclipse projects. 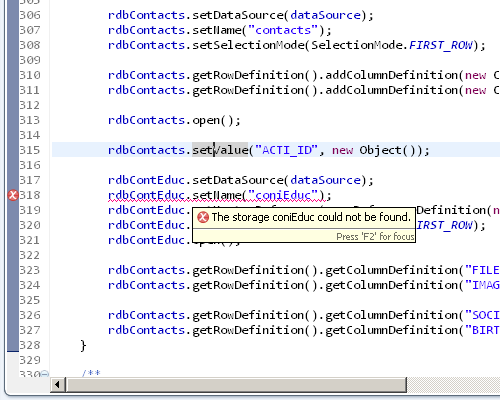 So all you need to do is import the project into Eclipse and start working on it. To improve this workflow further EPlug does offer various features. 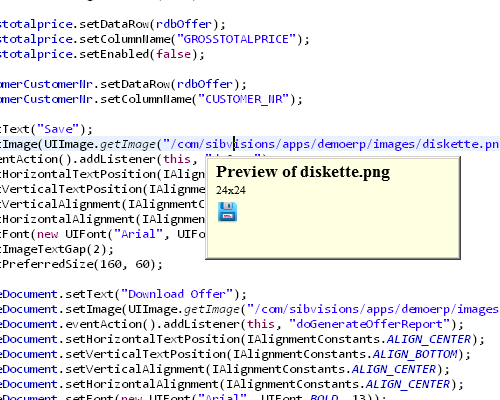 VisionX will also automatically refresh its current view if you change a sourcefile in Eclipse, allowing to rapidly and verify changes in a workscreen without the need to manually reload the workscreen. EPlug comes in two flavors, EPlug for JVx and EPlug for VisionX, both are available from the Eclipse Marketplace and can be installed and used freely for 30 days. Afterwards a license is necessary to keep using all features.